The story begins on September 11, 2001. Their plane grounded, strangers Elliott and Joni meet in a common chaos as they discover a mutual goal of getting to New York City quickly. American Folk is the film, its lead characters played by Folksingers Joe Purdy and Amber Rubarth. The movie follows the path of the pair as the borrow a 1972 Chevy van with leftover guitars stored in the back. Surrounded by the shock of the attack in the country they cross from west coast to east. The carpoolers make Folk music for themselves and those they meet, discovering and sharing the healing power in music. Filmed across fourteen states, the van logged over 3500 miles in the journey of American Folk, the title a triple nod the term folk in the beauty of the country outside it’s the window, the style of music that has consistently helped humans heal, and to the kindness of the people that make America great. 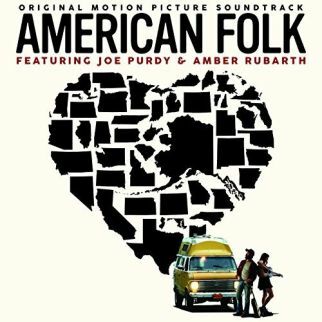 The American Folk soundtrack stars the same two leads as the film with the majority of the songs collected by Joe Purdy and Amber Rubarth. Tunes from John Prine (“Some Humans Ain’t Human”) and Jerry Garcia with David Grisman (“Freight Train”) among original music and covers of traditional Folk tracks from Joe and Amber. The Carter Family’s “Hello Stranger” is included in the American Folk journey along with songs that are the soundtrack of America with “Oh Susannah”, “Red River Valley”, “Swing Low, Sweet Chariot”, and “Oh, Shenandoah” among others. 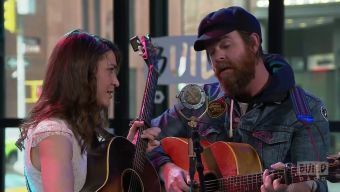 The album opens with a track by Joe Purdy (“This Old Guitar”) as the album offers tunes from Amber Rubarth with “New York” and “Townes” to the roster of songs from the pair as they play for American Folk.